Hurricane Irma, the strongest ever recorded hurricane in the Atlantic barreled through the Carribean and the entire state of Florida – wreaking havoc and causing massive amounts of flooding and destruction in its wake. Hurricane Irma’s devastation to property damage is estimated at $42.5 to $60 billion dollars – for those who were lucky enough to avoid catastrophic damage to your property from flooding or fallen trees, thank goodness. However, there are still plenty of homes who sustained water damage via rising water or wind-driven rain. Although minimal in the grand scheme of things, it’s still definitely something that shouldn’t be taken lightly. For those affected by minimal water damage from rising water or wind-driven rain percolating through porous building material, these DIY drying tips are for you. The goal here is to mitigate water damage in your home as much as possible, preferably drying building material in place without having to remove flooring material or drywall. And most importantly, preventing harmful mold growth. It’s important to assess your property thoroughly to pinpoint any affected areas allowing you to consolidate your drying efforts. It’s useless trying to dry an entire house when only one or two rooms are affected. Look for any peeling paint, separation of baseboards, delamination of flooring material, water stains, or a mildewy smell – these are all telltale signs of water intrusion and saturation. Once you’ve pinpointed and confirmed the affected areas you’ll want to double check for any visible mold growth. And if you find active mold growth, be sure to consult a licensed mold remediation contractor as soon as possible – mold is serious business. It’s important to remove and extract as much excess moisture or standing water as possible, if any, by soaking it up with towels or by using a wet vac. You’ll then want to set up air movement in the affected areas to accelerate evaporation. Direct air movement via simple box fans would be best, be sure to keep fans and airflow pointed in the same direction so they’re not working against each other. It’s also a really great idea to keep the affected room or area cool (78°F or cooler) to help prevent a suitable environment for mold growth. 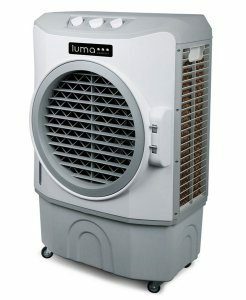 This can easily be done with your central AC unit, however, if you find yourself without power, this HVAC Company says that a portable and compact evaporative cooler will get the job done. These coolers can be powered by generators and as an added bonus will not only keep the room cool but you as well – check out this comprehensive guide of the best evaporative coolers in the industry. Once the affected area is dry, thoroughly cleaning and wiping the area down with antimicrobials will also help further prevent any hazardous mold from growing. Hopefully, by this time, you’ve managed to dry everything in place while mitigating any significant damage to your home. Sometimes, the affected area is too much for a couple of box fans to handle – hopefully, you never find yourself in this situation, but if you do, be sure to contact a reputable and experienced water mitigation company.